Kolkata: In June, when RP Infosystems Pvt. Ltd, a little-known maker of low-cost personal computers, stepped in to rescue Kolkata TV, a 24-hour Bengali news channel, from bankruptcy despite its Rs70 crore liabilities, it showed how keen businessmen in West Bengal were on investing in the media business. Despite financial backing from Hyderabad-based Associated Broadcasting Co. Pvt. Ltd, which runs one of the biggest television networks in India, Kolkata TV struggled to stay afloat for most of its life because it couldn’t ever generate enough revenue, its founder and former editor Tathagata Dutta had told Mint in August. 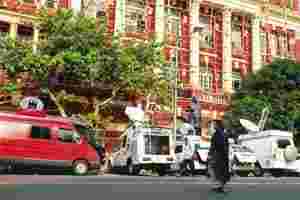 Kolkata TV was the third 24-hour Bengali news channel to be launched after Star Ananda, part of the Star News network, and the Zee News Ltd-controlled 24 Ghanta. In the past year, two more Bengali news channels—NE Bangla and Channel 10—have been launched and at least four more are in the works. “People who have no experience in media are getting into the business and they don’t seem to care much for revenue potential," said Arup Ghosh, a former television journalist who now offers consulting services to companies looking to launch news channels. With an eye on the assembly elections in West Bengal in the summer of 2011, even politicians seem to be getting into the business, added Ghosh, whose Network 1 Media Consultancy Pvt. Ltd is advising at least one new entrant in the Bengali news space. Rose Valley Group, which has interests in financial products’ distribution, hospitality, real estate and consumer goods, recently launched Ruposhi Bangla, a Bengali general entertainment channel, and is now preparing to launch a news channel. “We are going to launch a bouquet of channels, for which we have lined up an investment of around Rs60 crore," said Gautam Kundu, Rose Valley’s chairman. Icore E Services Ltd, which produces cement and steel bars, recently launched a Bengali newspaper and is planning a news channel in six months, according to its chairman Anakul Maiti. “Instead of applying for a new licence for our news channel, we are trying to buy one from someone who isn’t using it," said a director of the company, who did not want to be identified. “No one knows how many of these new channels will eventually make money," said Amit Ray, president and Kolkata head of Lintas Media Group. “Bengali news channels aren’t being launched out of conviction in profitability… People are investing in the business because of the intangible benefits of running a television news channel." For firms such as Rose Valley and Icore, it doesn’t matter whether or not their new channels are profitable, said a media analyst, who too did not want to be named. “The news channel would boost their credibility and help expand their other businesses," he added. “Even if their television channels aren’t profitable, they would recoup their losses from other businesses." The key problem with Bengali news channels is there aren’t too many advertisers, said Joydeb Chatterjee, chief financial officer of Media Content and Communications Services (India) Pvt. Ltd, which operates Star News in India. News Corp.’s Indian subsidiary Star India Pvt. Ltd holds a 26% stake in Media Content and Communications. Mint has an exclusive content partnership with The Wall Street Journal, owned by News Corp.
“Annual ad revenue for all Bengali news channels put together is around Rs75 crore, according to our estimate," said Chatterjee. That’s too little for so many channels. However, Star Ananda, clearly the most watched Bengali news channel, according to the latest report by television ratings firm TAM Media Research Pvt. Ltd, has been profitable from “the first full year of operation", or 2006-07, said Chatterjee. “What is more, we have registered a 20% compounded annual growth in revenues since launch," he added. Even 24 Ghanta, according to a key Zee official, has been making money since last year. “Our revenues have been growing at 25-30%, and don’t expect this growth to slow," he added, speaking on condition of anonymity. It’s a different story for others. For instance, Channel 10, promoted by another low-cost PC manufacturer, Xenitis Infotech Ltd, was launched a year ago, but has till now not managed to recover operating costs even for a month, according to Xenitis Group managing director Indrajit Chandra. “Channel 10’s monthly operating cost is Rs65-75 lakh over and above the Rs3 crore that we have paid for a year for distribution of the channel," said Chandra. “It seems for at least one-and-a-half to two years our channel will need financial support from other group companies." Channel 10 was so cash-strapped that it had to delay payment of salaries last month, admitted its executive editor Rajesh Sisodia. “It is very difficult for a stand-alone Bengali news channel to survive this competition," Sisodia said. “We need to join forces with a national network, and we are looking to do so." The launch of new channels would surely put more pressure on the revenues of broadcasters such as Channel 10, which has already cut advertisement rates to Rs250 for 10 seconds. “We’d rather say no to ads than cut rates further at least as of now," said Chandra. Channel 10 isn’t the first news channel Xenitis has launched. Three years ago, Xenitis was behind the launch of Kolkata TV too. But after its founders split, Xenitis withdrew itself from Kolkata TV. “We spent some Rs7 crore to launch Channel 10, which is a fraction of what we had spent to launch Kolkata TV," said Chandra, who had closely followed the launch of Kolkata TV as well. “You don’t need to stump up a lot of money to start a channel now, but if you cut capex (capital expenditure) and rely more on hired or leased stuff, your operating costs go up... It’s only after you start running a channel, you realize that even recovering operating costs is a huge challenge."